If you’re looking for a great family destination, you can find it all in Williamsburg, Virginia. With a beach near by, rich historical sites, and exciting family attractions there is something for everyone and enough fun to create a well rounded vacation. As we’re just a short drive from Williamsburg, we took a quick 4-day getaway to the area and had an incredible time with a different type of experience each day! I received select complimentary attractions in exchange for this post. The most important family attraction to add to your itinerary is a visit to Colonial Williamsburg. This revolutionary city can immerse your family in a full experience of what the United States was like in the 18th century. The entire town is showcased just like it would have been during the time period with reenactments and actors that help you relieve the experience. As you step into each of the different buildings of the time such as the Governor’s palace, printing office, courthouse, and weaver’s shop. These were a few of our favorite stops along with the brickyard and magazine yard. 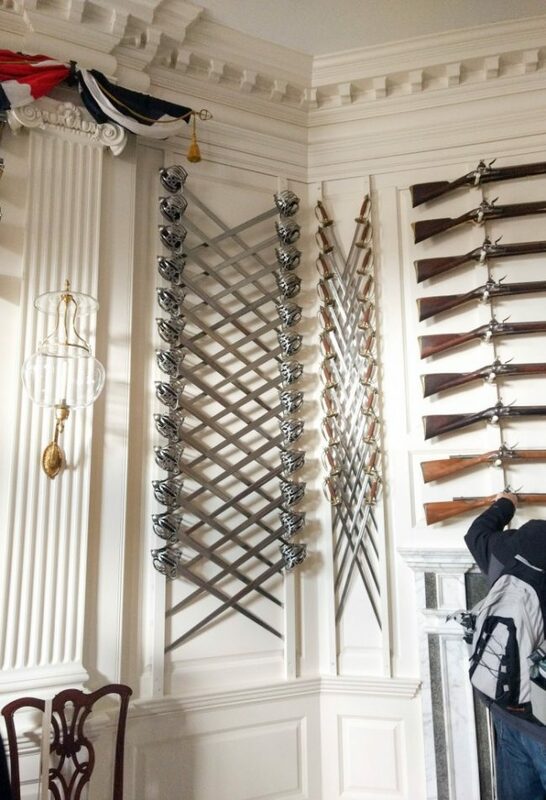 The displays of swords and guns all around the Governor’s palace was so impressive – they were everywhere! At each of the different trades, there are demonstrations and information that helps you learn about the time in an engaging way. For example at the George Wythe house we played a card game, Kings in the Corner, with Mr. Whythe himself. It was so fun to hear him speak with words we weren’t familiar with and with an accent from the time that helped the experience feel like an authentic step back in time. At the courthouse, our boys joined in the trial as sheriff and justices that made the reenactment exciting for them. 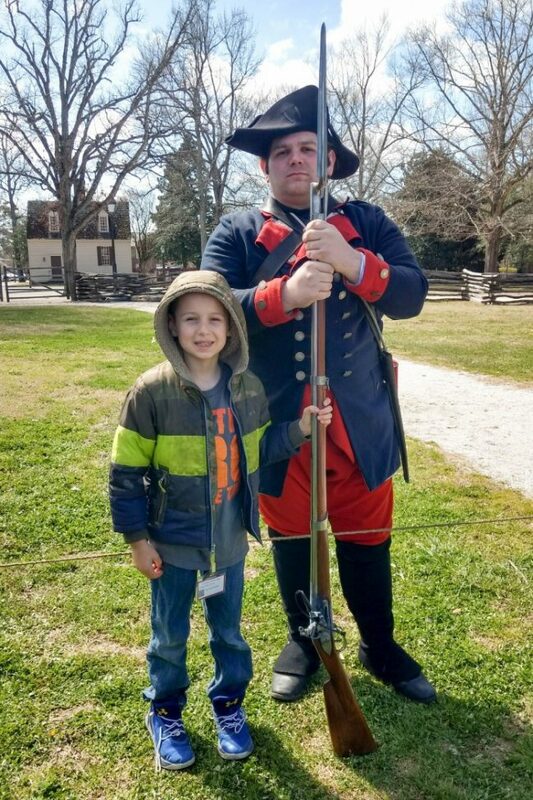 By the end of the trip, my 11 year old declared that our day spent at Colonial Williamsburg was his favorite as it was just unlike anything we had done before. Plan at least one full day to spend in Colonial Williamsburg. In one day, you’ll be able to experience some, but not all, of the building. You could easily spend a couple of days here, but make sure you spend at least one. 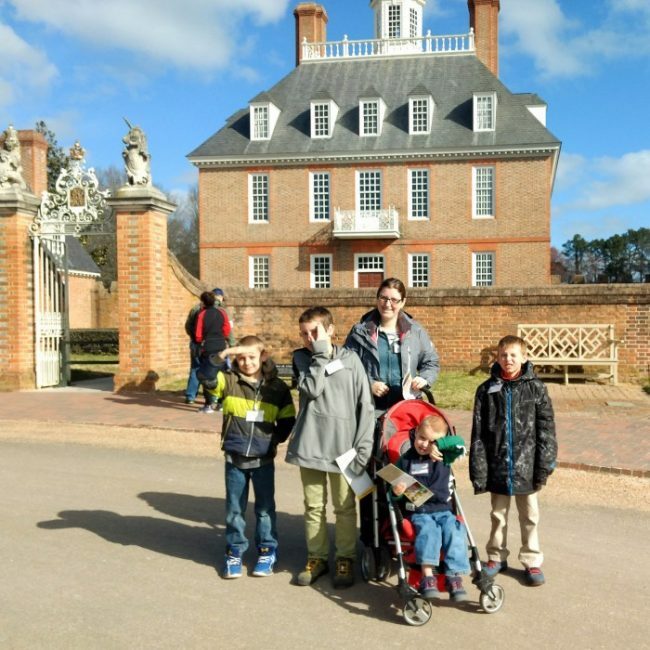 We booked our tickets ahead of time which made it easy to get started exploring Colonial Williamsburg as soon as it opened. There was a much shorter line for picking up tickets than for purchasing the day of. We waited just a few minutes to get our tickets and clip badge that would get us into each of the buildings. We booked everything before our trip using TripAdvisor. 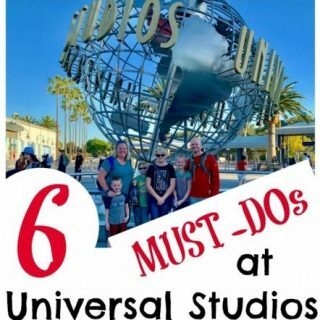 It was so easy to book all of our attractions and not have to worry about purchasing tickets our planning out each day once our family vacation began. 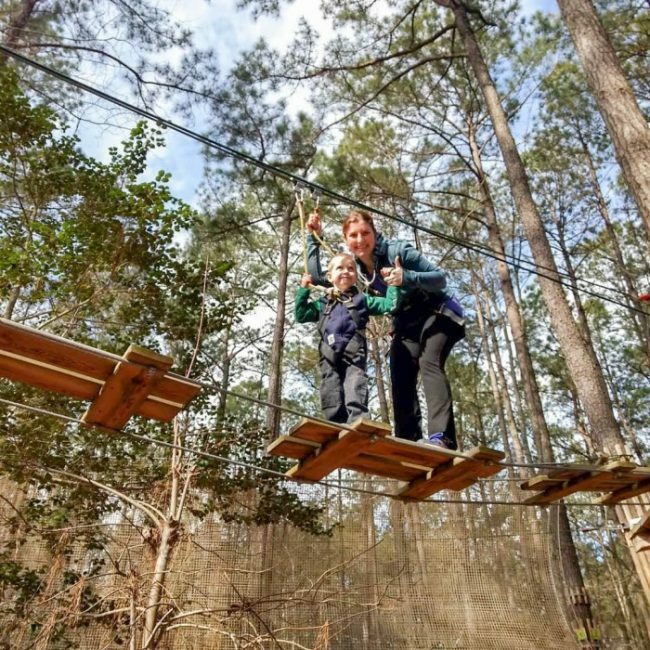 A great way to get out, be active, and have a ton of fun is with a visit to Go Ape’s Treetop Adventure Course. You’ll quickly learn the “ropes” and they’ll you will be off on your climb through the trees. 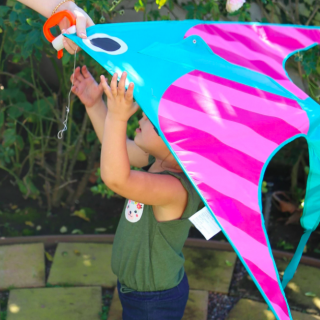 I loved how incredibly family friendly this activity was. 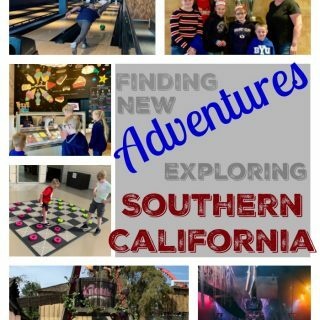 As a family of 6 with boys ranging in age from 3-11 it can be hard to find activities that everyone will enjoy. We split our group between the Junior Course where I went through the course with my 3 year old. I was blown away with how great he did out on the course. He was nervous and scared, but overcame his fear (with lots of hand holding) and loved every minute of it! He was especially nervous about the end zip line, until he was off down the line and couldn’t wait to work back through the course to go again! My 7 and 9 year old boys were able to independently work their way through the course and lapped up a few times. There are two different challenges in the Junior course which give variety and yet they’re all pretty closely grouped so I could check-in with them throughout the experience. My husband and 11 year old went off to the full Go Ape Treetop Adventure zipline course and had an incredible time. 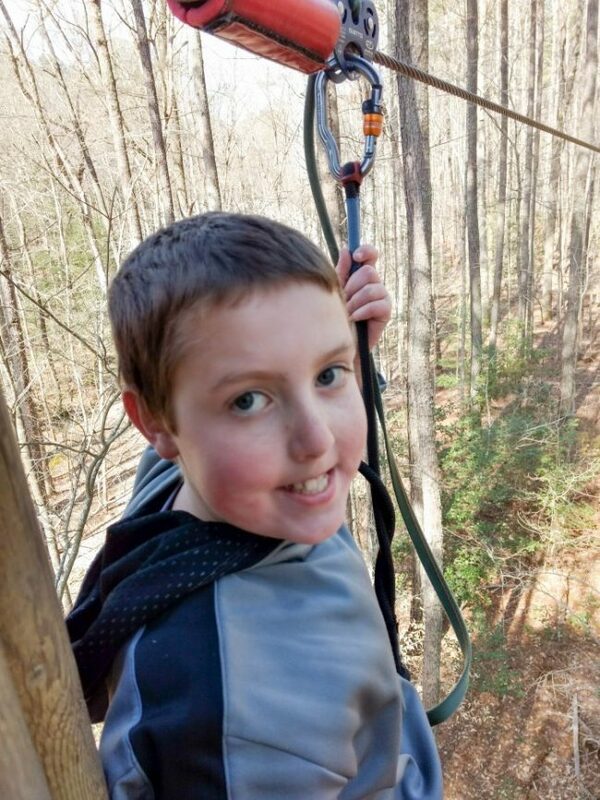 He’s already requested to have a birthday party at a Go Ape location with a few friends. We all left with stories to share and eager to come back again! 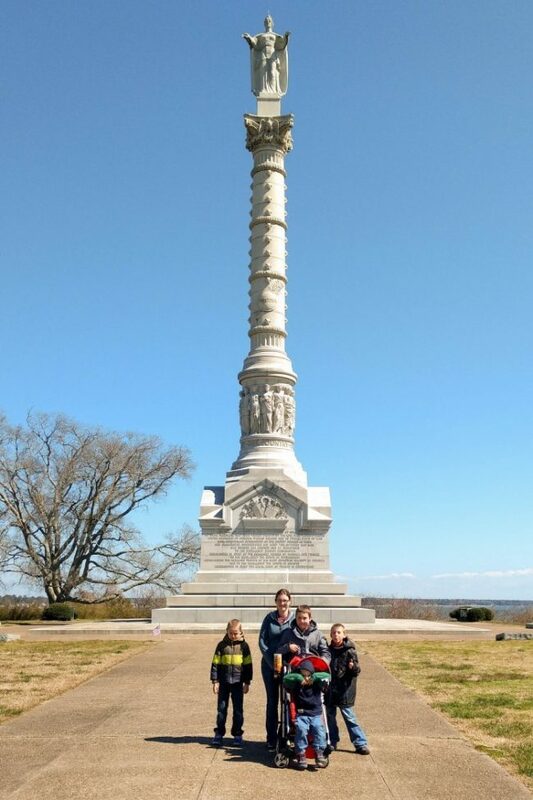 For a relaxed Sunday during our 4-day trip we headed to Yorktown to explore the battlefield and learn about the history in this historic area. It was so neat to see the earthworks that went in every direction. You could tell the battle took place from all sides, which was really interesting to see. 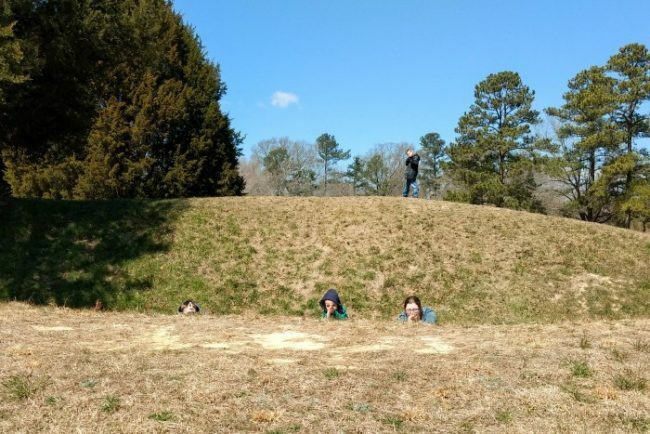 We had fun pretending to be soldiers on the mounds, and then the kids turned it into a roll down the hill game. Next, we headed down the path that’s about a mile. It was a really nice walk but you could alternatively drive around to the different viewpoints. 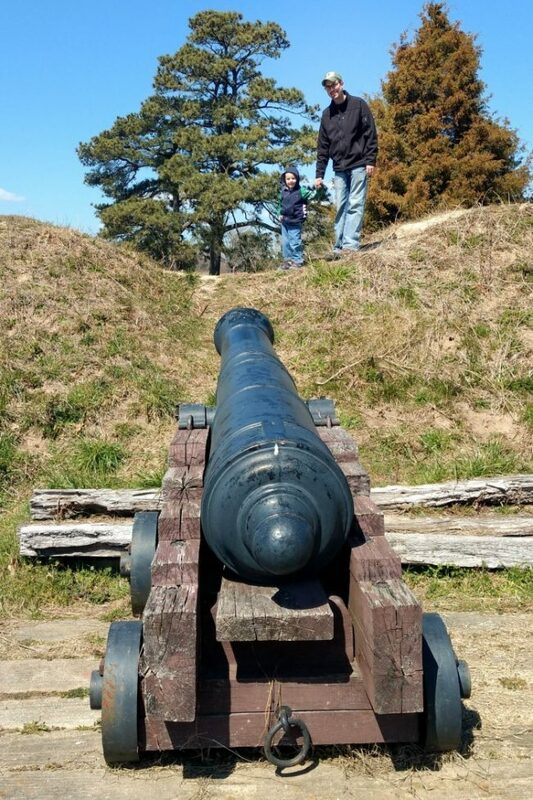 All of the boys were so excited when we started spotting cannons! The earth would be mound up around them, with a lower point for visibility and for the cannon to be able to launch. They loved climbing up along the top ridge that dipped and rose again at each cannon. 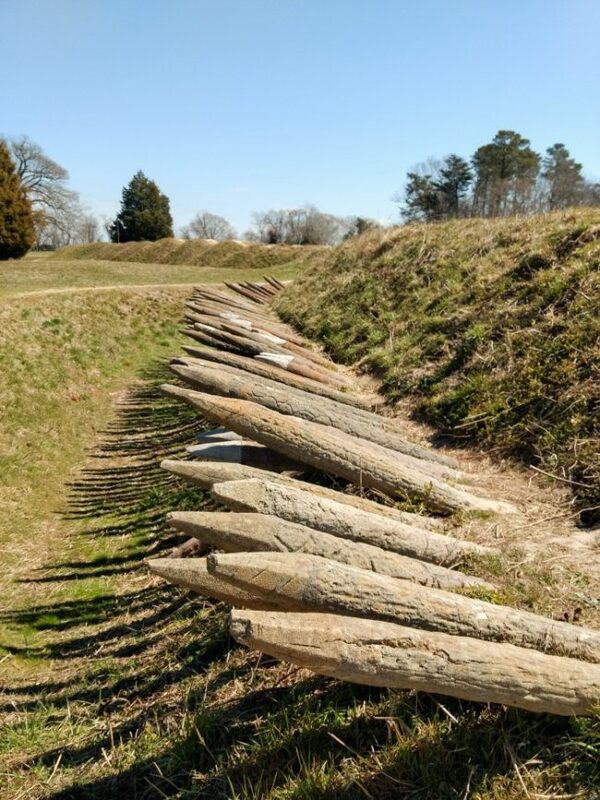 But our favorite thing to spot was the fortifications, timber palisades, built into the side of the earthworks created to make it more difficult for the enemy to approach them while they had time to fire on the enemy. These pictured here are replicas, but they were still really neat to see! We also took the quick walk over to the Yorktown Victory Monument which was really neat to see. It was built to recognize and commemorate this location as the battle that led to the ultimate revolution of America. So much history to learn about here in this area and in a way that makes it fascinating to the whole family. 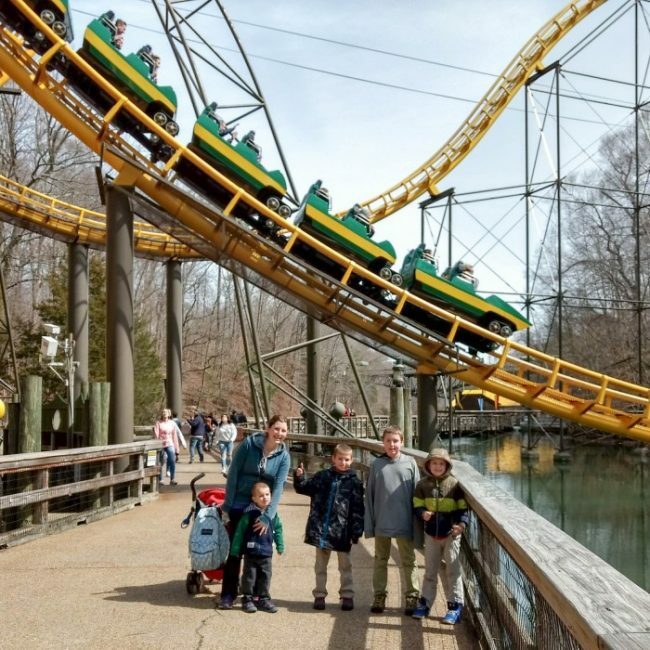 For the thrill seekers, a day at the nearby Busch Gardens theme park has something for the whole family. We spent time at Land of Dragons and Sesame Street Forest of Fun to make sure my 3 year old had a great time. The park is absolutely beautiful with themed lands to group the different attractions. You’ll take a trip around the world, all while walking throughout the park. I loved how well all the themes were integrated and it really felt like you were experiencing something just as we made our way through the different lands. 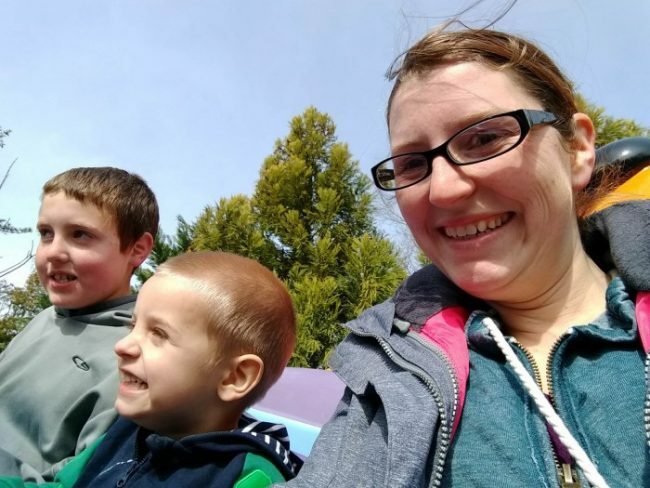 When it came time to go on the big coasters, family swap made it so easy to let both adults get to enjoy the rides that our younger boys couldn’t ride. There was enough to easily fill the day and leave us all excited to come back again soon! With all the variety and exciting things to do in Williamsburg, Virigina, it’s the perfect vacation destination for a weekend getaway or a full week long trip! No matter how much time you have available, you’ll love visiting the area. You won’t want to spend your vacation time on trying to make plans for the day, figuring out your schedule, and securing tickets. Take care of all the booking before you leave with TripAdvisor. It’s so convenient to have one place to search for attractions, read reviews, skim for details such as hours and days of operation, and then book all your activities. I really appreciated that I could add all of our bookings to the cart so we had one clear price, with no hidden fees, and easily view our bookings throughout the trip. Booking with TripAdvisor was fast and easy and I felt confident booking after the helpful reviews and knowing that the purchase is backed by a low price guarantee! At the attractions it was a seamless and easy experience using our bookings for admission. We had all the information easy to access including address and directions, contact information, hours, and any other pertinent details. 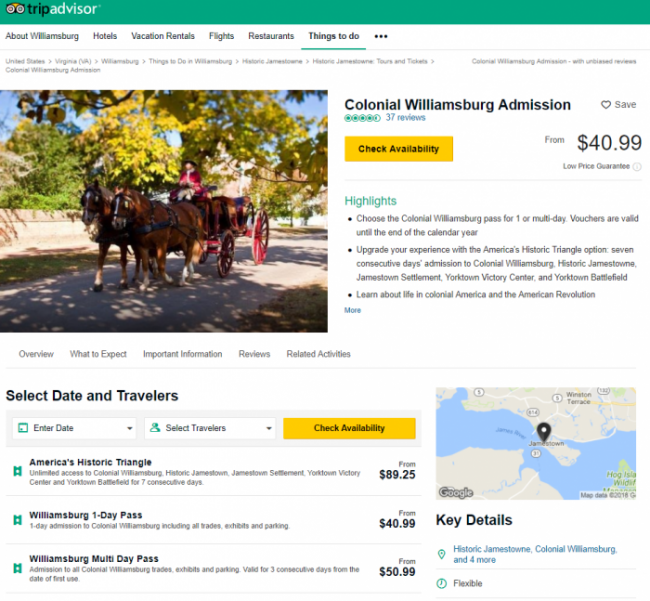 Visit TripAdvisor to start planning your family vacation to Williamsburg. My husband used to train for the Navy right outside Williamsburg, so I used to go with him and enjoy the sights around town. 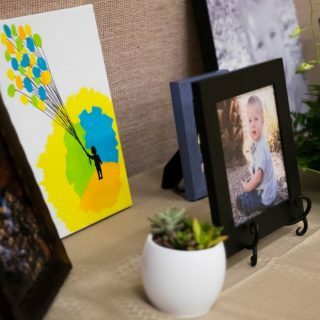 I should go back with my kids now, we haven;t been since my son was a little baby. Want an amazing time. I live about 6 hours away and would love to head over either this fall or summer. These sound SO fun! Looks like the whole family will surely enjoy! I love historical sites such as this. I Am going to keep it on my radar for our travel bucket list! Williamsburg is our fave vacation destination spot. Water Country USA is another top family attraction. I love traveling! I don’t go to Virginia much but this definitely makes me want to take the family there. 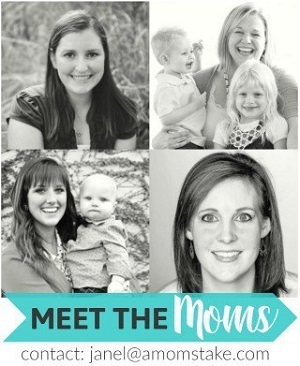 I’m putting this on my travel bucket list – looks like a fabulous family vacation destination! History and fun all in one! My kids want to go to Busch Gardens so I will definitely look into some of these other places when we go. I can see my son wanting to explore the tree top adventure course. This looks like such a blast! We recently did Gettysburg, same sorta feel and it was a big hit with our crew. Now we need to get to Williamsburg! This does look like a great place to see and has so much to do. My son loves history and politics so I think he would love this and the beach. Williamsburg is high up on my bucketlist. I hope to get there this year or next. I haven’t been to Williamsburg in years. I remember going to Busch Gardens. I absolutely loved it. I need to bring my family and hit these fun family attractions! SO cool! What a fun family vacation. My kids would love that zipline! This looks like such a fun place to visit. Perfect for over the summer vacations. This is the kind of place I love to take my family to. It’s so full of history, and it’s so much fun to explore!